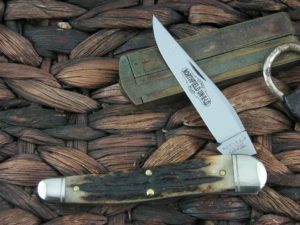 This is the Great Eastern Cutlery Northfield Oregon Trapper Hunter, has Cocobolo Wood handles and Brass liners. The blade steel is 1095 and finish is Satin. *Our opinion: The pull is a 5. The GEC effort on this run as compared to their entire catalog is 7. 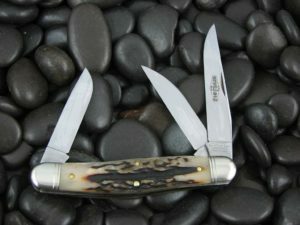 5 out of 5	GEC, the Swiss watch of Slip Joint knives. 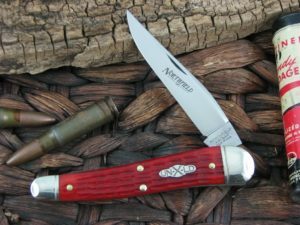 Upon receiving the #43 Northfield in Cocobolo, it has been a hard knife to put down. The fit and finish is superb and the action is very nice! 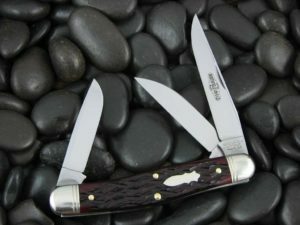 The GEC products I have obtained from Collector Knives are all beyond my expectations! 5 out of 5	Beautiful knife! The handles are beautiful, and overall fit and finish is excellent! I like the rounded edges on the handle. Right now, its too pretty to use, so I can’t comment on its function. After opening and closing it a few times, I don’t see any blade rap on mine, but the action is still a trifle stiff. As you can see, the grain on these #43 Cocobolo covers is wonderful. The fit and finish are also pristine. Mine has a bit softer pull than that Micarta version, but not unpleasant at all. The walk and talk is acceptable, not the best GEC can do, but not lazy either. I do have some blade rap on mine, but that should sharpen out over time, and I’ll just make sure not to snap it closed: easy problem to avoid. This is a great knife! Great fit and finish. Pull is just fine in my opinion. Not a nail breaker but makes a great EDC. Service from CollectorKnives has been outstanding! Just received my new trapper! Fit and finish are perfect with nice walk and talk!! Ever since Saul Goodman ordered a custom desk in Cocobolo wood, I’ve wanted a knife in this handle material. It’s beautiful, and I understand is a traditional handle, along with ebony, from the early 1900s. Nice piece of history.